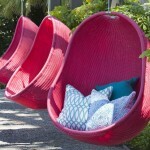 You are currently browsing the The Hammock Gazette blog archives for the day Monday, July 23rd, 2012. I just love watch children play on the beach! They are so entertaining, maybe I am easily amused, but they are so darn cute exploring the sand, building sand castles, and in some cases, putting the sand in their mouths! Then there are the babies that are just along for the ride. They seem to love napping in their portable playpens, they are so resilient, really. My boys were on the beach with us from the time they were 4 months old. I had an idea yesterday while on the beach, as I was seeing all the young Moms caring for their children and babies. Wouldn’t this pink Outback Chair cove be so awesome in the nursery of a baby girl? You could hold her and read or sing to her before bedtime in her hammock chair. Then she could grow up with it, reading, doing homework, hanging out as a teenager, then finally, raising her own children with it.